Penguins & Friends: Hey! That's My Fish! 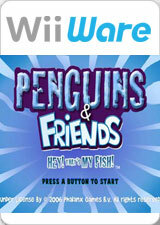 In Penguins & Friends: Hey! That's My Fish! you can become the fishing king! The penguins are hungry and need your help to feed themselves. Catch all the fish you can before someone steals them from you! Strategy is fundamental in this exciting game. Keep moving ahead of the other penguins so that you don’t get trapped, and try to get to the ice floes that hold more fish. The graph below charts the compatibility with Penguins & Friends: Hey! That's My Fish! since Dolphin's 2.0 release, listing revisions only where a compatibility change occurred. This page was last edited on 30 December 2017, at 10:29.